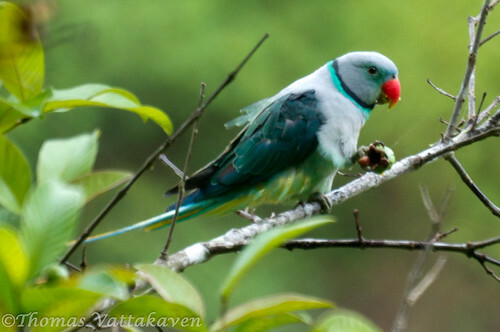 The Blue-winged parakeet (Psittacula columboides) is also known as the Malabar parakeet, and is endemic to the Western Ghats of South India. Pictured above and below are the male bird. It has a range of about 50,000 square Km and hence is classified under the "restricted-range" species by the IUCN. 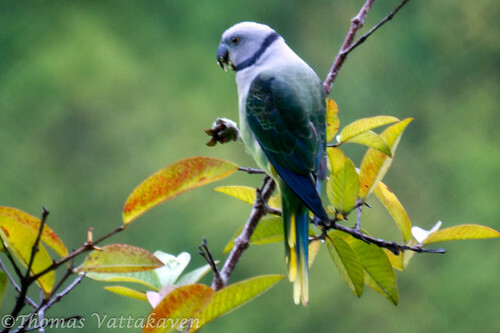 As with other parakeets it is threatened by poaching for illegal pet trade. 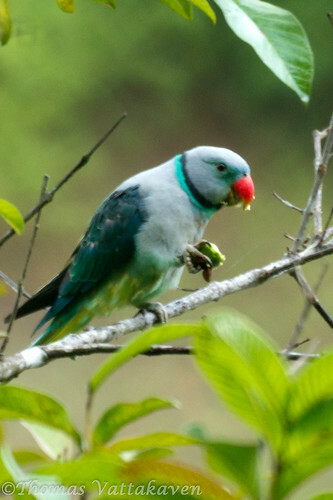 While the male bird is a bluish grey with a double ring of brilliant light blue and dark grey around its neck, the female is less colourful (see image below). The male also has a red beak and greenish feathers in front of its eyes. The female has its beak coloured in black and lacks the greenish colouration. These birds are social creatures and can be seen in groups of 4-5 individuals, flying and feeding in noisy groups. 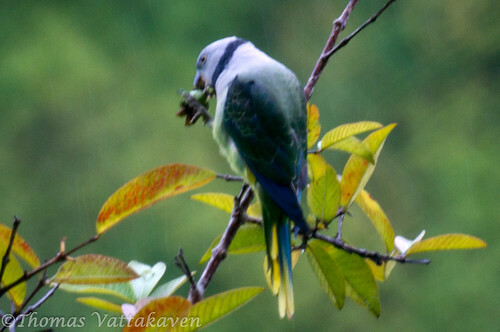 These images were obtained on a rainy day at the Periyar National Park, Thekkady, where they can be seen.